I don’t know about you, but developing ongoing creative content for social media can become a challenge sometimes. We know that creative content grabs your audiences, encourages them to act, and drives results for your organization, but sometimes we get into a rut. 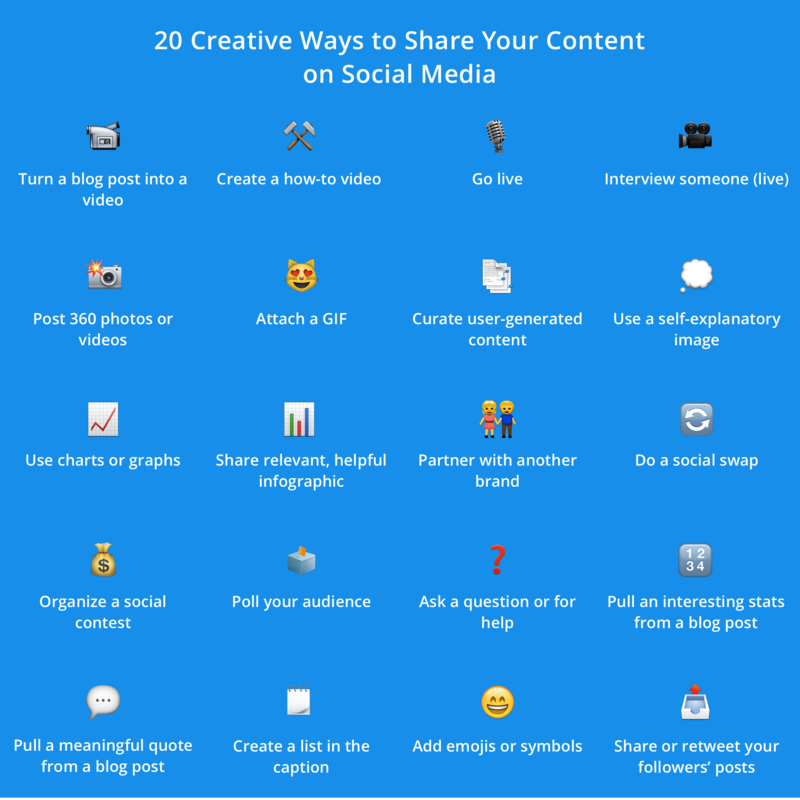 Our friends over at Buffer created an awesome visual (see below) that provides 20 great social media content ideas. You could seriously produce over a month’s worth of content with these ideas! Turn a blog post into a video: We know that video captures peoples’ attention and results in more shares than most other social media posts. Why not repackage a blog post into a video? Why not use Superintendent’s welcome back message, and, rather than getting a picture of the Superintendent at his or her desk, why not get some great B-roll of your students, teachers and staff engaging in activities that support your superintendent’s message, and use the message as the narration? Go live: Facebook’s “go live” feature is a great way to bring the news to your followers as it’s happening. Non profits–this is a great way to capture footage at an event as it’s happening; schools can capture real-time “first day of school” activities and more. Interview someone (live): Go out to one of your district’s schools during an anti bullying week, and play the role as the roving reporter that asks each student about how they will prevent bullying. Post 360 photos or videos: Buildings and campuses look pretty cool in 360 degrees! So do groups of people–inside or outside. Attach a GIF: What is it with GIFs? Somehow they capture the essence of a thought or mood in familiar and silly ways. “How principals feel on the first day of school” with a fun (and positive) GIF is one way to capture people’s attention! An idea to try: Buffer suggests using Animoto (or your favorite video-editing tool) to turn one of your recent blog posts into a short 30-second video. Curate user generated content: Curate photos that people have posted on your social media accounts, or, experiment with a short user-generated content campaign (and you can decide if you want to continue with it after the experiment). Would I share this content myself? If you answer “yes” to at least two of the three questions, you have likely found yourself a self-explanatory image. Use charts or graphs: Another type of explanatory image is charts and graphs. Use a graph or chart to illustrate key information about student performance, expenditures and more. Share a relevant infographic: Using an infographic creator, you can easily explain the nuances of school district budgeting, how test scores work, and more! Partner with another organization: One of my favorite tactics to build into my clients’ social media strategies is the idea of leveraging partnerships–mutually-beneficial partnerships will help you reach new audiences and grow your social media following. Maybe you have a partnership with a large non profit or a business that is helping your students. Work together on content that leverages both of your organizations. Do a social swap: Similar, but simpler that partnering with another organization, in a social swap, two organizations exchange relevant content regularly and share the other company’s content on their own social media accounts. With a social swap, you get great content to share on your social media accounts and benefit from having another organization share your content. Poll your audience: People love sharing their opinions, and you can use the poll as a means to collect data from your audiences. Ask a question for help: People love to help, and if you ask people about their favorites (what is your favorite school event? What can our district do to better serve your child? ), preferences, etc. this is another way to help you better understand your audiences and their motivations. Pull interesting stats from a blog post: Using a statistic in your introduction is often recommended as a way to “hook” your readers and keep them reading. If the statistic is relevant (and shocking) to your followers, they might be more intrigued to read your blog post or watch your video. Use this as an opportunity to share statistics that help your organization or can help parents with their child’s educational experience. Create a list in the caption: Provide a picture that draws someone to a list of information on your website. Use a portion of your post to include this list, but a teaser to bring them to your website for more information. Add emojis or symbols: Emojis have become quite popular with audiences–in fact, 6 million emojis are shared on social media each day! I hesitated on whether or not I would support this idea, but here’s the first rule of thumb-consider whether emojis are consistent with your brand and image. Here is some great info on shortcuts and how to use emojis in your social media posts. Share or retweet your followers’ posts: Don’t you love it when someone retweets your posts? Well, do the same for your followers! Retweet blog posts, social media posts, and more–it shows you appreciate what they are doing, as well. Want more inspiration and examples? Visit Buffer’s blog post on this topic.